In all our floor repairs, we use the latest belt sanding machines that produce great results and avoid judder marks that drum machines can create. 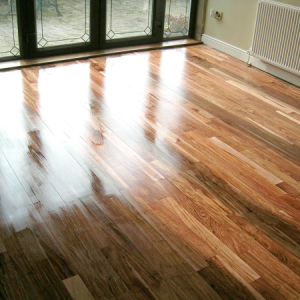 We always finish our floors with a buffing machine to give the very best finish. All our sanders have superb dust collection and can be connected to the dust control system – reducing the effect of the renovation on the rest of the premises. These advanced control systems mean the whole process is less intrusive and requires very little clean up. Floors are often damaged by plumbers and electricians. We have a wide stock of reclaimed timber to repair floors with sound wood that matches. Even if you think the damage is too bad to fix, give us a call, there is often a lot we can do with existing boards, or substitute with a closely matched replacement. Filling the gaps between boards is a great way to reduce draughts and improve the look of your floor. For wider gaps we use slithers of wood glued in place and sanded flat. This means a smoother, better looking floor that is also less draughty. As properties are altered, a hearth can become redundant, but can be messy to remove. It is possible to remove a hearth and replace the base footprint with 2 floor boards supported by a wooden frame. The result is a gain in useful floor space, a tidier room, and a continuation of the beautiful wooden floor you already have in place. Where no mat well is in place, we can fit on to suit. This keeps the mat in place and helps increase the protection of the surrounding floors. Perfect for winter where wet boots are being brought into the house. A mat well is good means of defense against dirt and wet coming in on footwear.